You can even stop an termite infestation before it happens! While they’re certainly less common than your average insect, termites can cause a whole lot more damage than most other pests, and can even threaten the structural integrity of your home. That's because they can chew through wood, flooring and even wallpaper without you ever even noticing! "The problem is that you usually don't see them because of their underground tunnel and if (they are) in the house, they are within the walls, attic, etc.," said Dr. Thomas Chouvenc, a professor in the Department of Entomology and Nematology at the University of Florida. Most often, homeowners deal with two main types of termites — subterranean and drywood — and they each come with their own set of challenges. Subterranean termites (the most common type of household termites) form large colonies underground and build mud tubes to provide moisture while they make their way back and forth between a colony and a food source (aka, the wood in your house). They can spread in an underground tunnel that's more than 150 feet long, and feed on various wood materials within the environment. Drywood termites, on the other hand, are harder to detect and are most common in the Southeast and Southwest regions of the U.S.
"Drywood termites have a different type of biology that allows them to infest homes without coming in contact with the soil. These termites not only infest the wood used in the construction of the home but can also infest wooden furniture as well," Cooper said. Termites love wood, so they typically feed on your house's structure and walls, but they especially enjoy wood that's come in contact with the soil. Wood damage: According to Mannes, termites like to eat wood from the inside out, so if your wood sounds hollow when you knock on it, you may have a problem. Rotting wood is also a dead giveaway of a termite problem. Mud Tubes: Subterranean termites need moisture while they travel back and forth between their colony and their food source, so they build mud tubes. You'll find them most often near your home's foundation, but can also be found in basements or crawl spaces. 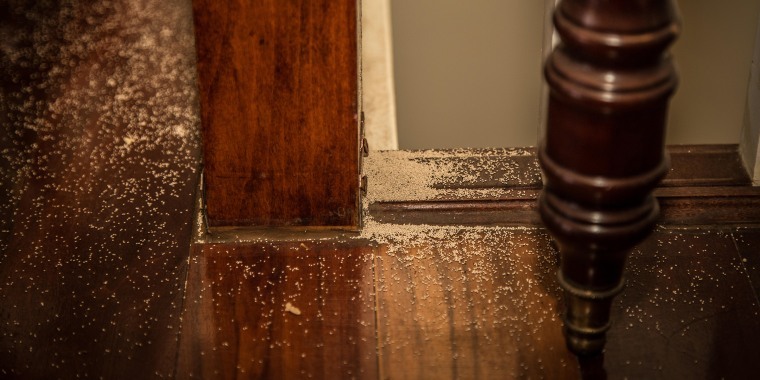 Frass: Drywood termites like to leave behind these powdered shavings while they're eating through wood. Swarmers: These young female and winged termites can often be found in homes during spring and are often mistaken for flying ants. "If you see ant-like creatures both with and without wings, as well as discarded wings on the ground in the area where the swarm occurred, it may be termites," Cooper said. The good news? Termites won't negatively affect your health. The bad news? They can wreak major havoc on your home. “Thankfully, termites do not transmit any disease, nor do they bite people. However, the structural damage they can do if left unchecked can be incredible!” Hartzer said. According to the National Pest Management Association, termite infestations can cause more than $5 billion in property damage each year. Yep, that's billion with a "b." If that's not bad enough, consider this: many homeowners’ insurance policies don't cover termite damage. And whenever we're talking about structural damage, we're talking big bucks. Unlike some other pests, termites aren't easy to eliminate on your own. Since many homeowners don't detect a termite problem until it's rapidly spread, it's hard to contain the situation without the help of a professional. "Termites can cause widespread damage, so it is always best to work with a qualified professional in the event of an infestation. Depending on the species, professionals will recommend a treatment that is tailored to your home’s needs — which could include anything from a liquid treatment to a baiting system or, in the case of drywood termites, even fumigation," Cooper said. Don't overdo it on the mulch! Keep it at least 15 inches away from your foundation. Seal up any holes or cracks on your home's exterior. Keep firewood (and any other wood) at least 20 feet away from your house and five inches off the ground. Keep an eye on any exterior wood, including door frames, windows and skirting boards, for any visible changes. Send water away from your house. "Termites also need moisture to survive, so homeowners should ensure their property has proper drainage and that gutters and downspouts route water away from the structure. Ensure equipment such as air conditioners are also inspected for condensation lines or other components that may produce moisture and that they are properly routed away from the structure," Cooper said. Make sure your attic, basement or crawl space is dry and well ventilated. Watch out for mud tubes. "Both inside and outside, look for mud tubes that some termite species build as they make their way up from the soil and into your home." Hartzer said. When you do work with a pest-management professionals, they'll typically use a range of termites treatments depending on the severity of your termite infestation. "For subterranean termites, the use of liquid termiticides to create a chemical barrier around the structure to prevent termite access to the colony has historically been used in the U.S. however, within the past 20 years, the use of termite baits has been preferred because of their ability to result in colony elimination, and because they are most green technology," Chouvenc said. Drywood termites, on the other hand, often require a different type of treatment. "You usually realize you have them when the colonies have completed their life cycle (around five years) when they swarm within the house or if you see small sand-like grain particle piling up on the floor, which is a sign of active infestation. Therefore, the primary way to deal with it is structural fumigation (tenting the house). Only state licensed pest control operators can operate this method. Do not DIY!" Chouvenc said. Looking to banish more than just termites? Check out our guides to getting rid of bed bugs, rodents and ants.